Usage Analysis in Learning Systems . Published 2009 . Publisher: Association for the Advancement of Computing in Education (AACE). teaching and learning. 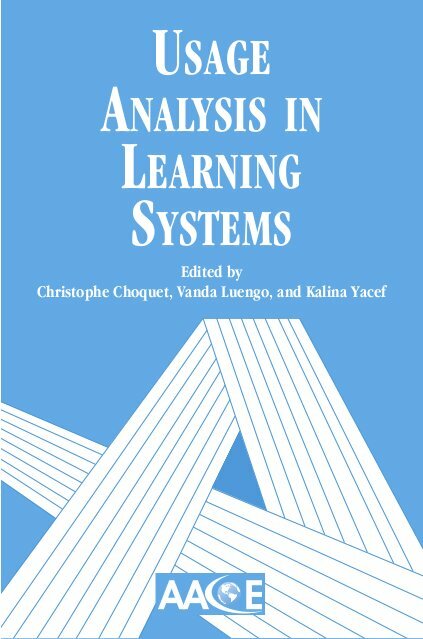 The articles selected for this special issue are extended versions of the papers presented at the workshop on Usage Analysis in Learning Systems, organized in conjunction with the 12th International Conference on Artificial Intelligence (Amsterdam, The Netherlands, July 2005). Choquet, C., Luengo, V. & Yacef, K. (2009). Usage Analysis in Learning Systems . Association for the Advancement of Computing in Education (AACE). Retrieved April 22, 2019 from https://www.learntechlib.org/primary/p/30472/. Avouris, N., Komis, V., Fiotakis, G., Margaritis, M. & Voyiatzaki, E. (2005). Logging of fingertip actions is not enough for analysis of learning activities. AIED’05 workshop on Usage analysis in learning systems, 1-8. Carron, T., Marty, J.C., Heraud, J.M. & France, L. (2006). Helping the teacher to re-organize tasks in a collaborative learning activity: An agent-based approach. The 6th IEEE International Conference on Advanced Learning Technologies, 552-554. Cooley, R., Mobasher, B., & Srivastava J. (1999). Data preparation for mining worldwide web browsing patterns. Knowledge and Information Systems (KAIS), 1(1), 5-32. Egyed-Zsigmond, E., Mille, A. & Prié Y. (2003). Club [clubsuit] (Trèfle): A use trace model. 5th International Conference on Case-Based Reasoning, 146-160. Feng, M. & Heffernan, N.T. (2005). Informing teachers live about student learning: Reporting in assistment system. AIED workshop on Usage analysis in learning systems, 25-32. France, L., Heraud, J.M., Marty, J.C., Carron, T. & Heili J. (2006). Monitoring virtual classroom: Visualization techniques to observe student activities in an e-learning system. The 6th IEEE International Conference on Advanced Learning Technologies, 716-720. Iksal, S., & Choquet, C. (2005). Usage analysis driven by models in a pedagogical context. Workshop Usage analysis in learning systems at AIED2005: 12th International Conference IMS (N.d.). Global learning consortium: Learning design Specification, http://www.imsglobal.org/learningdesign/. Martel, C., Vignollet, L., Ferraris, C., David, J.-P., & Lejeune, A. (2006). Modeling collaborative learning activities on e-learning platforms. The 6th IEEE International Conference on Advanced Learning Technologies, 707-709. Marty, J.C., Heraud, J.M., Carron, T., & France, L. (2004). A quality approach for collaborative learning scenarios. Learning Technology newsletter of IEEE Computer Society, 6(4), 46-48. Mazza, R., & Milani, C. (2005). Exploring usage analysis in learning systems: Gaining insights from visualisations. AIED’05 workshop on Usage analysis in learning systems, 65-72. Zaïane, O.R. (2001). Web usage mining for a better web-based learning environment. Conference on Advanced Technology for Education, 60-64. Henri, F., & Landgren-Cayrol, K. (2001). Apprentissage collaboratif à distance: pour comprendre et concevoir les environnements d’apprentissage virtuels. Sainte-Foy (Québec, Canada): Presses de l'Université du Québec, ISBN 2-7605-1094-8. Hotte, R. (1998). Modlisation d’un système d’aide multiexpert pour l’apprentissage coopératif à distance. Unpublished doctoral dissertation, Université Denis Diderot/Paris 7. Iksal, S., Barré, V., Choquet, C., & Corbière, A. (2004). Comparing prescribed and observed for there-engineering of e-learning systems. IEEE Sixth International Symposium on Multimedia Software Engineering, December 13-15, 2004. Miami (USA). Koper, R., Olivier, B., & Anderson, T. (2003). IMS Learning Design v1.0 Final Specification [on-line]. Available: http://www.imsglobal.org/learningdesign/index.html. Jonassen, D.H., Davidson, M., Collins, M., Campbell, J., & Bannan Haag, B. (1995). Constructivism and computer-mediated communication in distance education. Journal of Distance Education. 9(2), 7-27. Lejeune, A., & Pernin, J-P. (2004). A taxonomy for scenario-based engineering. Cognition and Exploratory Learning in Digital Age (CELDA 2004), December 2004. Lisboa (Portugal). 249-256. Morch, A., & Mehandjiev, N.D. (2000). Tailoring as collaboration: The mediating role of multiple representation and application units. CSCW'2000, December 2-6, 2000. Philadelphia, Pennsylvania (USA). 75-100. Delozanne, E., Vincent, C., Grugeon, B., Gélis, J.-M., Rogalski, J., & Coulange, L. (2005). From errors to stereotypes: Different levels of cognitive models in school algebra, Proceedings of E-LEARN05, Vancouver, 24-28 October 2005.